In her debut fantasy/romance YA title, The Sharing Moon, author Christy Campbell weaves a compelling tale of do-overs, regrets and redemption as experienced by a pair of troubled, star-crossed teens. Q: Let’s start by telling readers about how your creative journey as a writer first began. A: I first started writing short stories and poems in middle school. I won numerous awards for fiction and in high school, my Creative Writing teacher read my work as an example and told me that I should pursue writing. When I was unemployed last year, it was a good time to get down to business and finally start the book I’d put off for so long. Q: Did you read a lot as an adolescent and teen? If so, what were some of your favorite titles/genres and who were some of the favorite authors that had the most influence on your personal style as a storyteller? A: I read a ton and still do. In earlier years I loved Carolyn Keane, Judy Blume, Beverly Cleary, and I would say Judy Blume’s young adult novels stuck with me the most. Mysteries and adolescent angst were my favorites. Then in high school I got heavily into Dean Koontz and found a pull toward science fiction/fantasy. I liked that he threw romance sometimes into such dark stories. I got into John Grisham too, who reminded me of Koontz in a way. Q: If you could have lunch with one of those favorite authors, who would it be, where would you go, and what question would you most like to ask him/her? A: Definitely Dean Koontz! We’d go somewhere near the beach, since he always impressed me with his details of the California coast. I’d ask him where on Earth he comes up with the compelling ideas for such ‘out there’ topics. A: I just finished the last book in the Delirium series, Requiem, by Lauren Oliver. It’s in the YA genre. 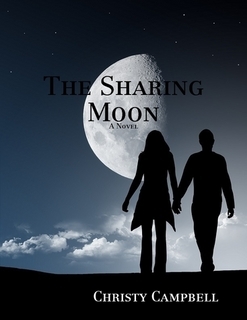 Q: So tell us what your new book, The Sharing Moon, is all about. A: A teen boy, Elijah, has died, and cannot recall any memories of his former life. He is stuck in between two dimensions, Before and After. Given a second chance to go back and live a new life, he finds the cost of such involves more than he imagined. He’s sent back to help another teen who battles her own emotional issues and the relationship becomes quite complicated. Elijah has no idea how his past has led him to the girl, but he learns along the way and it is very intriguing and heart wrenching as well. There is mystery and romance and some spirituality as well. Q: What was your inspiration to write it? A: I had this jumble of thoughts in my head to write about depression and how it affects teens. But I wanted to place a fantasy/romance aspect into the story so that it wasn’t too gloomy. I have dealt with depression and my husband, who was the same age as my character when we met, inspired a lot of the ideas. I wasn’t as severe as the female character, however. To portray both sides, I needed to have dual protagonists. Q: The plot unfolds in South Haven, Michigan. Why did you choose this particular setting? A: We love South Haven. There is no other Lake Michigan location in our state that is prettier, in my opinion. We’ve been there so many times and it’s so hard to leave. I know the area well and felt a lakeshore town was an interesting place to place teenage characters who live there year round, and don’t consider it just a tourist’s city. Q: Which of the characters in your book was the hardest to write? Conversely, which one was the easiest? A: Seraphina’s mother, Marah, was the hardest to portray. As a reclusive, emotionally damaged woman, there was a lot of background I had to cover and do it with her being a character who isn’t featured as often. Elijah and Seraphina were equally easy to write, the two lead characters, because I was a teen girl once, and remember first love very well. Writing a strong teen boy wasn’t as hard as I thought; his personality came very naturally to me. I thought of my husband. Q: Do you see aspects of yourself in any of the characters? A: The female lead, Seraphina, suffers a form of depression from a traumatic experience. I have been through a different type of depression and related to many of her issues. Q: If you could go back and be the age of your young protagonists, what “do-over” moment would you most want to change and why? A: In my own life, I would spend more time with my father, who died when I was 22. As a high school girl, I wish I’d appreciated the days I had with him more. High school years are all too consuming. Maturity seems far out of reach at 17 and 18. Q: Did you start with an outline or simply wing it as you went along? A: I used nothing except the mass of thoughts in my head! No outline, although I stopped dozens of times when I was out somewhere or doing something and sent myself long text messages of scenes I’d just came up with out of the blue. Q: Was anyone in your circle of family and friends allowed to read chapters in progress or did you make them wait until the whole thing was done? A: No one was allowed to see anything. I’m not sure why I was so protective about it. My mom is the first to have read the paperback from start to finish and absolutely loved it. I was worried what my family might think, even though I was proud of my work. Q: Writing is a solitary craft. In your view, what’s the value of having a support network or critique group? A: It can be good and bad. Unfortunately, I’ve found only a few family members and online groups to be the most encouraging. I’ve not received the support from friends and colleagues as I assumed. If I did, however, I’m not sure I could handle their opinions. What if they hated my work? I’ve gotten some great comments from some contacts who have made it so worth it already. Q: From your perspective, what are some of the biggest challenges – and joys – of writing for today’s young adult market? A: A positive right away that sealed it for me was the fact that YA novels cross over to the adult audience as well. With YA there is more to play with when it comes to fantasy type storytelling. The challenge, though, is breaking out a plot that hasn’t already been covered by all of the other YA authors. A: I self-published, which has some advantages. I was able to list my book as an eBook on Amazon and Barnes & Noble, and with the help of a publishing press called Lulu, I have paperbacks available now. A: That hiring people is stress-free for a reason! Editors, agents, marketing people, you pay for those services and don’t have to worry about anything. I’d love to go that route. Q: Is there a takeaway message from The Sharing Moon you’d like YA readers to discover? A: I’d like readers to understand that mental illness during the teen years, or any age, is not to be taken lightly and we need to reduce the stigma. I’d also like to inspire young people to face obstacles with strength and learn that friendship and love can move someone to really embrace faith and hope. Q: Okay, let’s say that Hollywood comes calling to turn The Sharing Moon into a movie. Who is your dream cast for it? A: If I ever had faces pass through my mind it was someone who looks like Zac Efron now but 18 years old, for Elijah and someone who looks like Dakota Fanning at 17 for Sera. As for the rest, I can’t come up with anyone yet! A: Well, I only have a few (smile) but they might not know that I am somewhat introverted, desperately want to learn to play the piano, and that I cry at the drop of a hat. A: If something successful happens with my book, I will begin a follow-up about one of the secondary characters in The Sharing Moon. The antagonist named Damian. I also will be job hunting, since my college degree is actually in the human services field. A: I have Facebook and Twitter pages listed under The Sharing Moon, and a Goodreads profile under Christy Campbell/The Sharing Moon. I am working on a blog as well.